With the end of the 15th LokSabha, the RajyaSabha passed the crucial anti-corruption law the Whistleblower Protection Bill, which is one of the six anti-graft bills that have been presented by the government as potential efficient tools against corruption, almost two years after it received the consent of the LokSabha. The bill, which provides for protection of whistleblowers, will now become law after the president's assent.This bill, which was pending in the Indian Parliament for several years, provides for protection of Indian whistleblowers keen to expose corruption. India is among the 140 countries that have signed the UN Convention against Corruption. Even as 40 Indian whistleblowers have been killed in the past 5 years and incidents of harassment, fear and violence have been reported by whistleblowers across the country, activists of Right to Information have been protesting to pass this legislature. 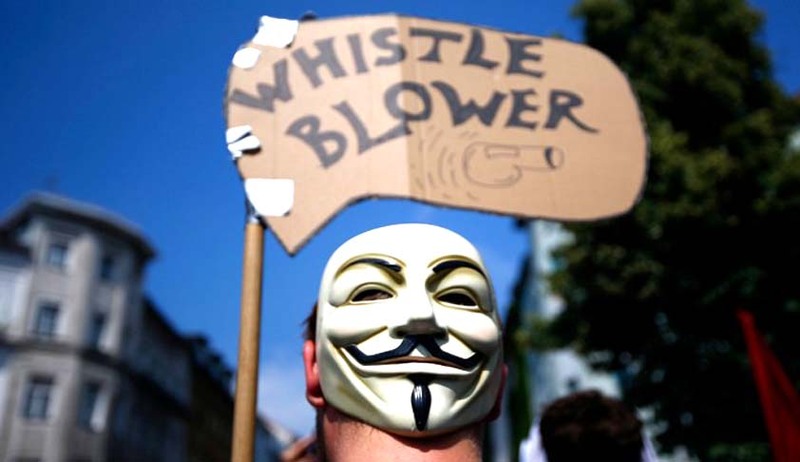 The act of revealing information by an employee or any stakeholder about an illegal or corrupt conduct within an organization is known as Whistle blowing. In 2001, a suggestion was made by the Law Commission that in order to eradicate corruption, it was important to have a law to protect whistleblowers and thus, drafted a Bill in its report. In 2004, the Supreme Court, replying to a petition filed after the murder of Satyendra Dubey an Indian Engineering Service officer who was killed after he tried to reveal corruption in the Golden Quadrilateral highway construction project in 2003, directed that till a law is enacted, a device be implemented for acting on complaints from whistleblowers. In 2004, the government notified a resolution that gave the Central Vigilance Commission (CVC) the authority to act on complaints from whistleblowers. 1,354 complaints have been received by CVC since 2004, from whistleblowers. In 2007, a recommendation for enactment of a specific law to protect whistleblowers was also made in the report of the Second Administrative Reforms Commission. In 2011, the LokSabha passed the Whistleblower Protection Bill, which was then taken up by the Upper House in 2012 for consideration. Broadly seen as an instrumental weapon for anti-graft activists exposing bribery and cheating in government practices, the bill when implemented, would create a legal framework to probe and accuse cases of corruption involving government officials. The bill seeks to provide for setting up a regular mechanism to inspire persons to reveal information on corruption or intentionalmisappropriation of power by public servants, including ministers.Besides setting out the procedure to investigate into the revelations and providing suitable precautions against victimization of the whistleblower, it also seeks to provide punishment for false or frivolous complaints. A disclosure can be made to the Central or State Vigilance Commission by any public servant or any other person including a non-governmental organization. The identity of the complainant has to be included in every complaint. The identity of the complainant shall not be revealed by the Vigilance Commission except to the head of the department if he considers it necessary. Any person who discloses the identity of the complainant will be penalized as per the Bill and also prescribes penalties for consciously making false complaints. The definition of 'disclosure' has also been amended to include willful misuse of power or willful misuse of discretion, which leads to obvious loss to the government or obvious gain to the public servant or any third party.The definition of competent authority to which a complaint can be made has also been expanded. A suggestion was made that steps should be taken to protect those who had blown the whistle on corrupt practices before the bill was passed, to which Minister of State for Personnel V. Narayanasamy said the government has already brought a resolution in 2004 under which the CVC was permitted to protect the whistleblowers.